BonusBall is a classic color Lines game with very nice graphics. 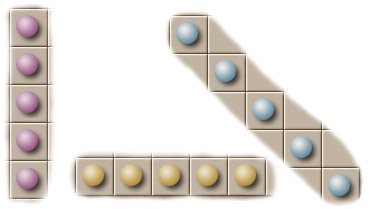 It is a puzzle game for players of all ages that encourages logical thinking. Moving balls can block each others road. With every turn you may move only one piece and only if there is a clear path to its destination. Three more pieces appear on the playfield randomly after each move, unless you removed a line. You receive points for every removed line. Aligning more than five pieces gives you even more points but it is risky as you might not be able to complete the row if a new ball appears in an unsuitable place. The game ends when the playing area is filled and no more moves are possible.